For all things about the eye, look here. The ophthalmologic exam is a procedure that you’ll perform throughout your entire career as part of the physical exam. So in this section we’ll show you how to conduct a basic eye exam, using Welch Allyn ophthalmoscopes. You can also learn more about the anatomy of the eye, how the eye works and view side-by-side eye pathologies along with helpful clinical studies and evidence. The eye is the only place in the body where veins and arteries can be seen noninvasively. An exam can reveal important details about a patient’s general health, such as the effects of high blood pressure, diabetes, or concussion. When performing an eye exam, the basic steps are the same for most ophthalmoscopes. Special features on each ophthalmoscope help support you during a challenging examination. 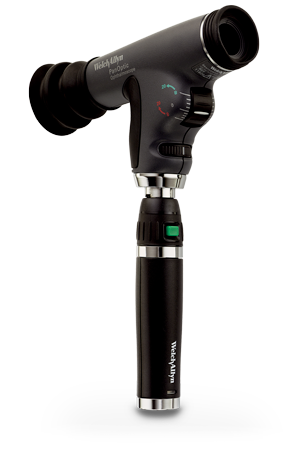 Welch Allyn manufactures two ophthalmoscopes – a traditional ophthalmoscope and our Welch Allyn PanOptic Ophthalmoscope, designed to give you a 25 times larger viewing area, helping support faster and easier examination of the eye. Learn about the anatomical structures of the eye, how these parts of the eye work together and view side-by-side images of a normal, healthy eye against common eye diseases and disorders. Visualize the eye and learn more about its structures. Learn more about how each part of the eye works together to support sight.